VOL. I NO. 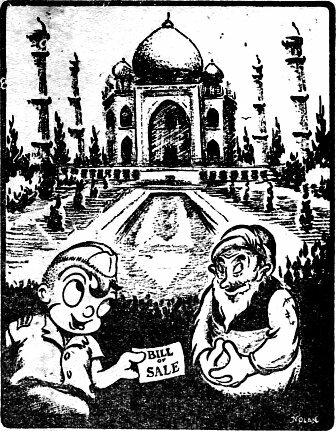 5 DELHI, THURSDAY OCTOBER 15, 1942. LOOK WHAT'S HAPPENING AT HOME - The caption we got said something about this being Brenda Joyce, 26, Excelsior Springs, Miss., and being a typical American girl. Who cares about that? We wanna go home and just SEE for ourselves. The Tenth U.S. Air Force has now been split into two distinct combat groups known as the China Air Task Force and the India Air Task Force, it was revealed recently by Brig. Gen. Clayton L. Bissell, commanding general of all air units in this theater. 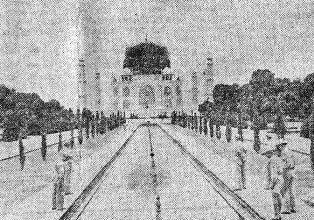 Speaking at the first of what probably will be a series of weekly press conferences, Bissell would only announce the bare structure of the new organization without reference to the commander of the India group. It has already been announced, however, that Brig. Gen. Claire L. Chennault leads the China organization. Answering a question on the AVG, Bissell stated, "The AVG was never a unit of the U.S. Army. The AVG, a unit of the Chinese Army, passed out of existence on July 4th and was superceeded by an American unit. Some of the personnel of the AVG are now members of the new American unit." Bissell explained that the Tenth Air Force actually arrived too late for the Burma campaign, but advance units carried much ammunition to Chinese and British troops, moved certain British units to reinforce British operations against the Andaman Islands and Rangoon, and managed to evacuate about 5,000 refugees from Burma. CHECKING A P-40 in a China air field hangar are members of a pursuit group of the China Air Task Force. Corp. J. B. Woodville, Corp. R. W. Briansky, Corp. C. E. Lehman and Sgt. C. E. Hoffman are the gents who keep the fighters in the air to the distress of the Jap. The Tenth Air Force commander refused to state what the Ferrying Command is doing now, saying that it was obviously unwise and would serve no purpose except to inform the enemy. He did confirm the fact that the Ferry Command has done night flying with load into and out of China, the exploratory flight having been conducted by Capt. John Payne. Stressing the wholehearted support received from Indian troops and British RAF and army forces, he stated that the work of the Tenth Air Force would have been impossible without the assistance of these co-operative Allied troops. The general purpose, duties and organization of the Tenth Air Force in the CBI Theater were outlined. "Two other component units of the 10th Air Force are the Ferrying Command and the American Air Base Command (Karachi). The American Air Base Command is the organization which receives most incoming American Air Force personnel and material. The Air Service Command receives most of that material and acts as a retailer to the two new Task Forces in China and India." The strategic Mogaung railway bridge, linking the river head at Katha with the Jap air base at Myitkyina, has now been completely destroyed by bombers of the India Air Task Force. Several previous attacks have been made on the bridge with damage having been done, but the recent raid completely destroyed the bridge. Supplies for Myitkyina come by river steamer up the Irrawaddy to Katha and are shipped from there by rail or truck. Continuing the offensive the American force attacked Jap barracks southeast of Loiwing and bombed a large suspension bridge south of Tinga, according to an official communique. In still another attack seven direct hits were scored on the Loiwing landing field while a second attack on the suspension bridge gailed to destroy the objective. Strafing attacks were made on two small river boats and a large steamer north of Katha, with the steamer being forced ashore. "One transport plane of the India-China Ferry Command with a crew of pilot and co-pilot is missing. Indications are that the loss was due to extremely bad weather and not enemy action," the communique says. Jap propagandists made a sad mistake a while back. It was a customary Jap error of failing to judge American temperament or temperature! In a radio broadcast to the Chinese they said: "Don't let the Americans fool you. They aren't giving you any help. They only have eight bombers here in China and their leader is an old, broken down transport pilot." Brigadier General Caleb V. Haynes, the "old broken down transport pilot," was, as we say, a bit browned off. He didn't care about the reference to bombers, but the other caused him to have a slow burn. Every time Haynes' bombers go out on a mission now they drop leaflets with messages of good cheer and signed: "Compliments of the Old Broken Down Transport Pilot." NEW THEATER INSIGNIA - Designed by Col. Frank Dorn, A.D.C. to Lt. Gen. Stilwell, the new theater insignia is here pinned on M/Sgt. Herbert J. Shanahan by Eileen Hay-Johan with T/Sgt. Howard E. Wilder looking on. Shield is done in red, white and blue carrying the Kuomintang Sun in the upper left corner and the Star of India in the upper right corner. - Resigned themselves while taking Indian girls to the movies, to taking their mother - and sometimes the whole family - too. - Counted the days till the return from the hills of the "pucca" memsahibs - blithe daughters of British Officialdom. - Received a monthly pay of 195 Rupees, 60 Rupees more than the pay of some British sergeants who support families in England. - Told Queen Mary, through Master Sergeant Daniel Dullea, that doughboys thought well of England. - Were happy to hear that libraries serving American field forces will be well stocked with Western thrillers and comics. - Watched Lord Halifax eat a doughnut at a Red Cross canteen; heard the Halifax deep bass harmonize on "Deep in the Heart of Texas." "The Best Band in India" - That is what the boys in the band expect people to say of them when they get into full swing. Practice sessions take place every other night in the Writing Room of "A" barracks. Right now, the boys are perfecting what they prefer to call a "close combination." Each an accomplished musician, some professionals who have played with "name bands," all of them are working hard to produce. The idea for the band was first conceived by Pvt. 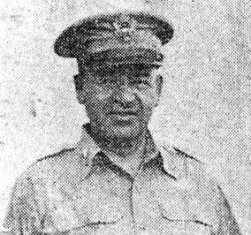 Tony Merendo, who with the active assistance of Chaplain McInany, contrived to obtain both instruments and men. Pvt. Merendo is continuing with the band as manager, since he plays no instrument. Where Merendo's job ends, S/Sgt. William Hackney's job begins. Sgt. Hackney, who is an expert with the Bass Fiddle and who played with Paul Whiteman's band for a short while at the Biscayne Kennel Club in Florida, is in full charge of all the music and orchestrations. For the present he is writing his own arrangements but very shortly he expects to receive 100 of the latest orchestrations from the United States. "Then watch our smoke," he predicts. An accomplished trombonist who turns out many a "hot ride," Pvt. Cliff M. Barnes practices regularly with the band and back in his bay. Barnes and Hackney, South Carolina and Florida, respectively. From the southwest comes our drummer, S/Sgt. William Baker of San Antonio, Texas, and our tooter of the alto saxophone, S/Sgt. Glenn T. Matthews, who hails from Sperry, Oklahoma. Sgt. Matthews learned lots of "stuff" while playing with Flips Rhythm Band. Sgt. Baker had a band of his own for three years and its popularity was due mainly to his ability in handling the drums. From the Northwest, the corn-husking State of Nebraska to be exact, comes S/Sgt. Edwin J. Davis to play the trumpet for us. He has played the instrument for 11 years, had his own band for a while, and when he joined the Army was playing with a local dance band. Working his nails literally to the bone on the steel strings of his instrument, S/Sgt. C. L. Sizemore strums a mean guitar. Latest additions are a piano player, Pvt. 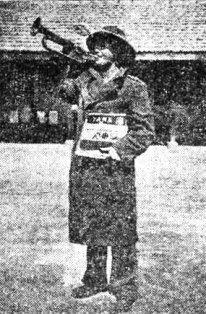 Aarensen, an accordion player, Pvt. Johnson, and a trumpeter, M/Sgt. Pete Dapero. Present plans are for working the band around Pvt. Aarensen, who plays the piano in the Eddie Duchin style. The big test for the band will take place at the Hollowe'en Party and Dance to be given on October 29, at which time the boys will strut their stuff in public for the first time. OVERHAUL PLANT - Here are some of the fellows who have a mighty important part in keeping our planes flying in the C.B.I. Theater. 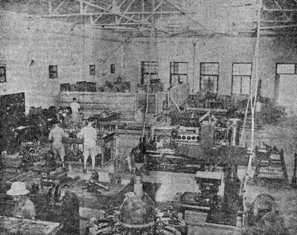 The scene is in the Airplane Engine Overhaul plant at an air depot which the U.S. Army Air Corps is now operating in India. 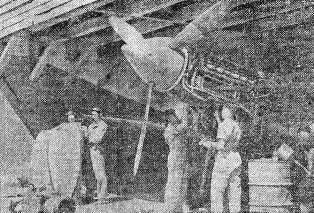 DISASSEMBLY - after the motors have been taken out of planes they move to the engine disassembly. Here, Corp. Frank J. Anceleski, Pvts. Francis Leland and Donald C. Allen apply their wrenches. INSPECTION - Sgt. 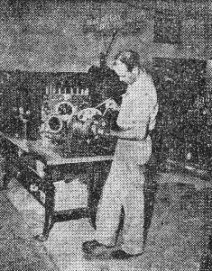 W. Crow operates a machine that tests for cracks or metal fatigue. Each part gets careful attention with this device that can pick out flaws too small or concealed to be seen by the eye. BEARING BAY - The work of "milking" the main crankshaft to fit a bearing is done by Sgt. William D. Massey. CONTROL ROOM - After an engine has been overhauled, it is completely tested before it leaves the depot. Sgt. 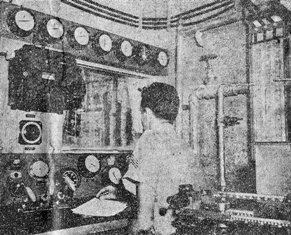 Granville G. Russell mans the control room for this test. Through the window ahead, he can watch the engine perform. 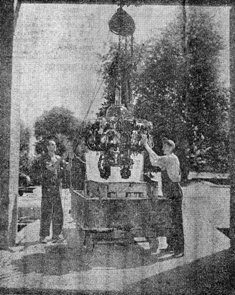 FINISHED PRODUCT - Fully tested and "pickled" - an oil spray that prevents corrosion - an engine is lowered into a shipping crate by Sgt. 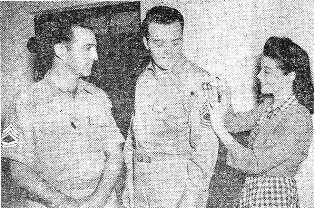 James G. Wallace and Pvt. William B. Miner. 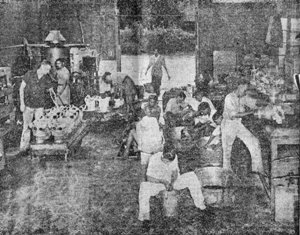 CLEANING - Many Indians are employed at this depot. In some cases, interpreters are necessary. Sgt. 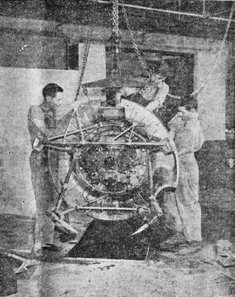 William C. Gafford (left) inspects engine cleaning done by Indian workers. This sector of the Theater of Operations was taken completely by surprise when the second issue of the Roundup appeared for distribution, as no advance notice that such a paper was being considered had been received. Two days later we were afforded an opportunity to glance at the first issue and were baffled when we, at length, located an article (on the back page) telling of the China Air Task Force. It is the consensus of opinion that a unit performing 90 percent of the offensive action against the enemy should receive a proportionate share of the space. PROMOTION - First Roundup promotion came from an Indian seaport where Pvt. John Cox bugles it out about the Roundup and Yank clutched beneath his arm. Get that coat pressed, pal. The Hq., 10th A.F., sent an official notification your way in plenty of time, Chum. Having the lead editorial and cartoon (even on page 8) devoted to you in Vol. 1 No. 1 is supposed to be a compliment. Since you are the correspondent, where is your copy? - Ed. 1. That there is no man living that has had to date, 7,500 combat hours. 2. If he was alive, he would have to be at least 1,000 years of age (approximately). 3. He would have been in at least 25 wars. 4. He would have to be better than Superman. 5. Ripley would sure be tickled to death to pay him for a write up in his "Believe-It-Or-Not." 6. Etc., etc., etc., etc. Read you paper Barge-bottom, we never said, "Combat hours." - Ed. 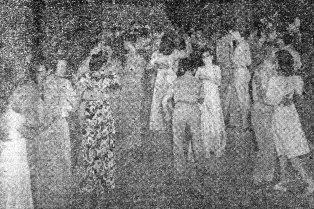 AMERICAN TROOPS threw a party for British paratroops in New Delhi a while back. Warrant Officer Harry Parnell of the paratroopers wowed them with his version of "Frankie and Johnnie." 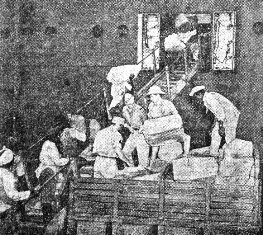 CHRISTMAS PACKAGES FOR HOME - Here are your Christmas packages being loaded on that old transport at an Indian port. Will the recipients or will they not pay import duty? Somewhere in the green rainy forests not far from Burma, American Air Force units located at the easternmost American air base in India are hard at work pulling their share of the United Nations' steadily growing war effort. 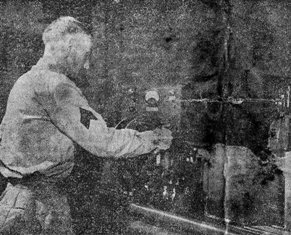 Details are necessarily omitted, but it is the story of the maintenance and active protection of the vital aerial supply line to China, of men who rise in the darkness before dawn and frequently finish their day's work with the aid of flashlights, men who have no baseball equipment and no time to use it if they had, men who until recently went without movies or PX supplies and did not complain, and finally, men who look up quickly when they first hear an airplane overhead. Here today, insomuch as it exists at all, is the Indian front. It is a beautiful country, on that all the troops are agreed and most of them have traveled by air from many different parts of India and so have had good opportunity for comparison. Spreading plantations of thickest tea bushes, flooded bright green rice paddies, and off in the distance the huge blue mountains against a soft sky of cottony monsoon clouds make a peaceful setting more appropriate to a Burton Holmes travelogue that a theater of military operations. The Indians, clean, fine-featured little people, do not think of themselves as being in the war zone, but carry on in their normal activities: walking down the road in long files wearing bright cotton print garments and carrying the ubiquitous black umbrella, creeping along in rumbling ox-carts, moving in droves through the tea gardens to pick off only the top-most leaves, wading in the paddies wearing their picturesque broad hats of straw to set out the young rice shoots, and sitting in the dooryards of their thatched-roof huts to look quizzically at the truckloads of khaki-clad soldiers that roar past in clouds of dust. Hold everything, boys, a bill has now been introduced in Congress exempting all overseas troops from import duty on articles valued at not more than $50. 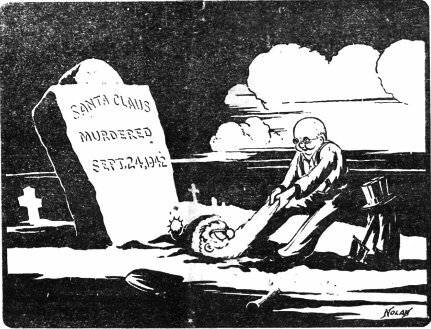 Above is artist Nolan's conception of Congress trying to revive Santa Claus. men at one time "soaping up," then taking turns on the pump handle to rinse off. Most of them do their own laundry, but a few trust their clothes to the tender mercies of a "dhobiwala" and the well-known Indian rock-wallop system of washing garments. Chow has been good, whether served field style, with the raucous outdoor mess kit line filing past a laboring battery of field ranges, or States fashion, past the kitchen window and to a neat mess hall full of tables. By night only flickering candles break into the darkness to illuminate the incessant blackjack and poker games and the letters home, with the writers sitting on bunks, pad balanced on knee. 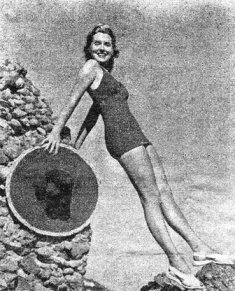 Up here where there are virtually no radios or newspapers the gramophone has become the savior of morale, and the songs it grinds out remind the boys of what America is like and by their associations recall a thousand memories. And as in all places where America's air force has moved in, improvements are constantly being made. Recent American movies are shown three times weekly in two different locations for the convenience of the scattered units. PX supplies have arrived and the boys can once again smoke the cigarettes that satisfy as well as indulge in the time-honored G.I. custom of eating between meals - cokes, cookies and candy. Hinduism includes many different sects and philosophies and beliefs. It holds that there is only one substance which really exists. This is Brahama. All other things only seem to exist. Brahama exists in all creatures but cannot be described because everything else is unlike it. Brahama has special forms as gods, human beings, or animals. There are many gods and people pray to them. The gods have different powers and various duties and a Hindu may worship any one or several. Worship is usually performed individually; a man makes offerings of incense or fruit and says his prayers in a temple or before a shrine. The main gods are Vishnu and Shiva; in a Vishnu temple the priest marks the forehead of the worshipper with the trident you will often see, and in a Shiva temple a horizontal smear of ash is rubbed across the forehead. Places of worship range from huge cathedral-sized temples to the tiny shrines which dot the roadside. All Hindus have this in commen: they all revere the cow and each Hindu has a place in the caste system. The cow gave the early Indians much of their livelihood in food, fuel and work, and came to be sacred. You will see cows wandering free along the main street of any town, large or small. Oxen still are the draft animals, dried cow dung is still used for fuel, and the cow is one of the chief suppliers of food. But there are so many that they cannot be cared for properly and each cow yields very little milk. But every cow - and many of them are the mangiest creatures you've ever seen - is sacred. In one part of India the punishmnet for killing a cow, even accidentally, is seven years in jail. Don't fool with them, or with peacocks, pigeons, and maonkeys; they also are sacred. Every Hindu is born into a caste. A caste is a class of people to which a man belongs by birth and from which he must take his wife. Most castes have traditional occupations which their members are likely to follow. There are hundreds of different castes. Each has a name and some special customs which distinguish its members from those of other castes. The Brahmans are highest. They wear a sacred thread over the left shoulder as insignia of their rank. High caste Hindus are vegeterians, for the eating of meat is considered defiling and they take care to keep themselves religiously pure in many other ways. Therefore, they must not come in close contact with those of lower castes who are not so pure. A man of higher caste may be polluted by brushing against a low caste person and will have to bathe in order to restore his purity. Food is especially important in keeping pure, and is automatically contaminated if touched by one of lower caste. AHHH!!! THE TAJ - India's world-famous Taj Mahal and its beautiful surroundings hold the interest of these U.S. Army men. Naturally, it's the top sightseeing attraction for all C.B.I. members in the vicinity. or the dish containing it, you may defile it and he may throw it away. Each caste generally has a traditional occupation. Those which do unclean work, such as scavenging, are low on the caste scale. The Chamar, who skins dead animals and dresses the hides, is one of the lowest castes. The Muchi, who handles the dressed leather, is superior to the Chamar, but also is very low. The lowest groups, sometimes called the untouchables, are the poorest. India is a poor country and those poorest Indians have so little and can get so little that Americans often wonder how they can live. Yet great men have come from these classes and there have been strong efforts in recent years to raise their level of life. Many of India's leaders, like Ghandi, have worked hard and in many ways to improve their condition. Part of the promise our victory will bring is the possibility of a fairer existence for these lowest of the low. Not all, sometimes not even most, members of a caste follow the caste trade or profession. Brahmans are traditionally priests and scholars (pundits), but Brahmans are found in many other occupations, ranginf from farming to accountancy. Many messengers (peons) in government service are Brahmans. They have a special advantage as cooks because food prepared by them may be eaten by people of other castes, all of whom rank below them.